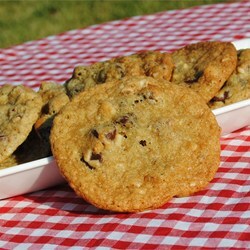 Scrumptious cookies with a tangy twist!! Combine white and brown sugar, butter and eggs. Stir in flour, baking soda and salt. The dough will be stiff. Stir in nuts, chocolate chips, rum and whiskey. Drop dough by tablespoonful onto cookie sheet. Bake 8 to 10 minutes.